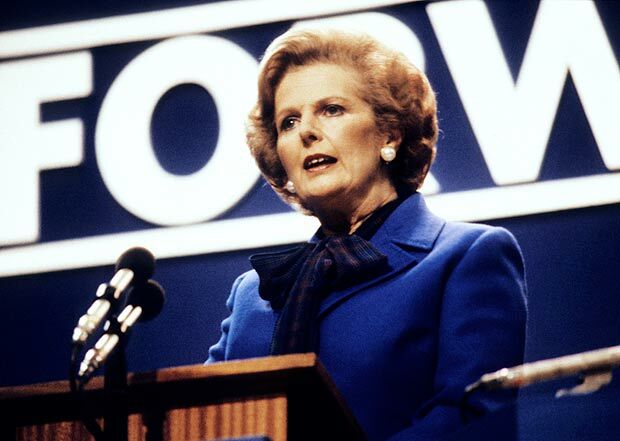 Home » Blog » Margaret Thatcher: Saviour or Devil? Margaret Thatcher: Saviour or Devil? 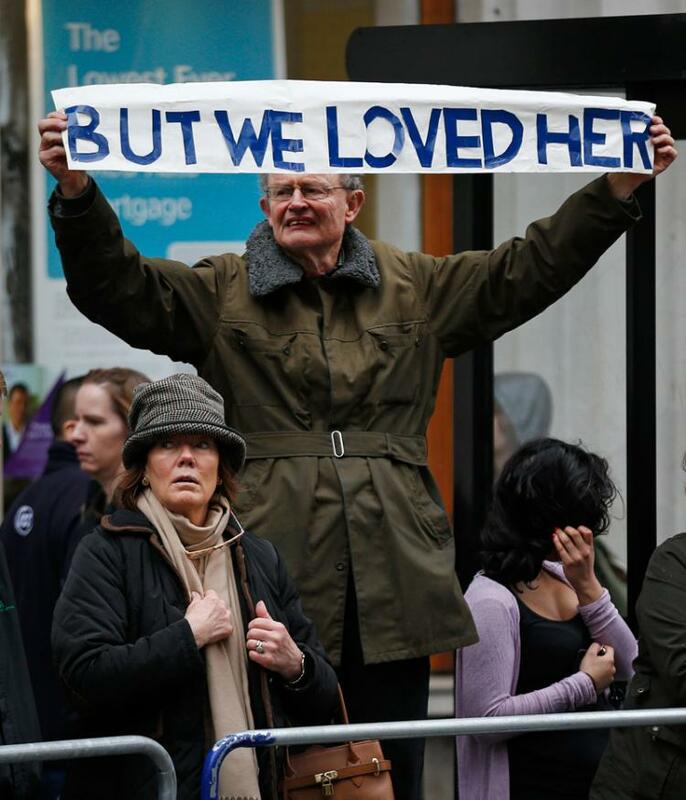 The responses to Margaret Thatcher’s death a fortnight ago (8 April), both at home and abroad, serve to remind us only too well what a divisive figure she was. As several tributes have been titled – eg: Ian Dunt at politics.co.uk – she was indeed ‘The Woman who changed Britain’. If you were one of those who saw the need unequivocally for those changes or indeed benefitted from them, then she may be a hero to you. My late father, Ted Rice, thought no less than that she had saved Britain. I once said to him: “You think the sun shines out of her arse!” – and he agreed totally. If you were one of those who lost out badly or were just deeply offended at the wholesale destruction of traditional working class communities as the result of her policies, then you may well view her as, to all intents and purposes, some spawn of the devil. My distant friend Chris Maguire would sometimes wear a t-shirt emblazoned with “I still hate Thatcher!” It wouldn’t surprise me entirely if Chris didn’t end up at one of those parties celebrating her death. As someone who has lived in the North of England all my life, was raised in the manufacturing town of St Helens and been engaged in projects concerned with ‘disappeared industries’, such as HemsMESH (coal mining in South-East Wakefield) and Humber MeshWORKS (docks and fishing in Hull), I understand (to some degree, at least) the bitter resentment and simmering hatreds of people from areas which suffered under Thatcher. It took a conversation a few years ago with Jon Freeman of the Centre for Human Emergence UK, a man I much respect, to really show me that people who were not particularly political and of my own generation (rather than my father’s) thought highly of Thatcher’s legacy. But then Jon does come from the South-East which, generally speaking, did rather well out of ‘Thatcherism’! The extremes of hatred for Thatcher and the extremes of unwavering support for her policies reflect an inability to appreciate viewpoints beyond your own perspective and show the workings of the Assimilation-Contrast Effect. In essence, the more the RED vMEME has invested your self-esteem in a viewpoint, the harder it is to see any merit in your opponent’s arguments. Even your less extreme friend may seem like a turncoat because they don’t support your extremes. Thus, Blair and even the once-supposedly-‘Red Ed’ Milliband can appear to be closet capitalists supporting the Establishment to the hard left while Cameron can be portrayed by the hard right as just the sort of ‘Wet’ Thatcher appeared to despise. The problem with being fixed by RED in the extremes of a political spectrum is that it leaves you unable to appreciate all other viewpoints and, thus, effectively deluded and incapable of getting a balanced perspective. Did Thatcher save Britain? If so, what was the cost? The argument that ‘something needed to be done’ in 1979 is unassailable. As Andrew Crisell (2002, p194) so poignantly reminds us, in the 1970s the country was plagued by “strikes, sit-ins, lock-outs, occupations, demonstrations, pressure and splinter groups…industrial stoppages were so common and inflation so rampant that Britain became known as ‘the sick man of Europe’.” This culminated in the ‘Winter of Discontent’ of 1978-79 when, as a result of various strike actions and union blockades, rubbish remained uncollected in the streets, many hospitals were forced to take in emergency patients only and, in Liverpool and Tameside, the dead remained unburied. Unsurprisingly perhaps, Margaret Thatcher swept to power in the 1979 general election on promises to curb trade union power and to reign in public spending. By 1985, following the collapse of the national miner’s strike, Thatcher had pretty much achieved these objectives. Thatcher’s policies in these respects can be characterised as coming from BLUE thinking. Unfortunately the BLUE vMEME, in its nodal state, is so focussed on doing ‘what’s right’ that the human cost of such policies is all but irrelevant. Thus, the Thatcher Government’s withdrawal of subsidies for increasingly-unviable state-owned monoliths such as British Coal and British Steel led indirectly to the wholesale devastation of working class communities in the Midlands, the North of England, South Wales and the Central Scottish Lowlands as their big industrial monoliths were wound down and/or broken up and scores of smaller support industries went to the wall without them. These communities were largely dominated by PURPLE and RED thinking. PURPLE tends to assign rigid gender roles, such as male breadwinner and female mother/housekeeper. The truncation of hundreds of thousands of jobs for unskilled and semi-skilled male labour in a relatively short space of time turned households inside out. Women tended to take 2 or even 3 part-time menial jobs (such as cleaning) while the men dossed at home, trapped in their ‘ex-miner’ or ‘ex-steelworker’ or ‘ex-docker’ identities, claiming benefits (where they could) and doing black market work (where they could). With this collapse of traditional PURPLE certainties – such as young adult males in the family having gone down the mines for the past 200 years – and the economic pressures put on households, family breakdowns multiplied, divorce rates spiralled and drugs and gangs stole in to further ravage the remnants of these communities. (The former mining town of Grimethorpe in South Yorkshire had the dubious distinction of being the first place in Britain where a bag of heroin could be obtained for just £5.) When PURPLE becomes destabilised, a very unhealthy manifestation of RED emerges to take over, seeing the world as a jungle in which the strongest and/or the most devious survive. The huge expansion of what Charles Murray (1989) labels the ‘Underclass’ – has its origins in Thatcher’s economic policies – see: Underclass: the Excreta of Capitalism. In a very real sense, the ‘Shameless’ culture which permeates so many of Britain’s sink estates is a by-product of Thatcherism. It’s not clear whether Thatcher didn’t anticipate the effect on working class communities – or she did but perceived it as worthwhile cost to pay. Either way, she had few effective social policies to counter the effects. So, yes, it can be argued that Thatcher did save Britain from union power and cut down a bloated and profligate public sector…but the cost was horrific and we are still paying the price 30 years later. No wonder, on the day of her funeral, in the South Yorkshire former mining village of Goldthorpe, they burnt an effigy of the ‘Iron Lady’! Thatcher understood the need for growth! Margaret Thatcher knew that you can’t just cut back but you also have to stimulate growth of the economy – a basic fact that seems to completely elude her successors David Cameron and George Osborne! So, it can be argued Thatcher not only saved Britain but launched the country on a new path to prosperity. The problem is that Thatcher’s policies failed to bring a great deal of Britain into that new prosperity. In essence, a few got very rich indeed but an awful lot of people got much poorer. The global financial collapse of 2008-2009 also exposed the over-dependence on the financial services sector of Thatcher and successive governments for growth. From a 2nd Tier viewpoint, away from the extremes of the Assimilation-Contrast Effect, Thatcher’s legacy is far from all bad. If the Government in 1979, of whatever party, had had a less strong and determined leader – another muddler like Edward Heath or James Callaghan, say – the economic decline might have continued over decades with the consequence that Britain might have ended up a Greece-like drain on the EU. Instead Thatcher’s hard right and ruthless tactics stopped the rot quite forcibly – and violently on the miners vs police battlefields of West and South Yorkshire. The likelihood, if Thatcher hadn’t come to power, is that everybody would have suffered a deterioration in living standards as Britain slowly ground to a halt, ever more dependent on begrudgingly-given International Monetary Fund and EU handouts. How that economic decline would have played out in terms of further social unrest is hard to imagine from a perspective of 30 years later. That being so, it has to be conceded that Thatcher undoubtedly changed Britain and she saved the country for the benefit of those ORANGE-driven wealth creators and those who made a reasonable living as a by-product of that wealth creation. Left behind, more or less to rot, were those – for the most part the traditional working class communities – whose thinking was dependent on there being steady jobs with steady incomes that required little more than low skill labour. Thatcher, then, saved us all to an extent. To ORANGE thinkers, she was a godsend who facilitated the generation of wealth by individuals. To those PURPLE-dominated working class communities, she was a devil who tore apart the lifestyles they had unthinkingly taken for granted for decades (and longer!) and offered nothing to compensate them for what was lost. The question to consider, then, in evaluating Thatcher’s legacy is not whether she had to do what she had to do. But could she have done it differently? Or, could she have done more for those who were displaced and dispossessed by the changes her economic policies brought about? Zygmunt Bauman’s (1988) concept of the ‘seduced’ and the ‘repressed’ is relevant here. The ORANGE culture of the endless pursuit of wealth Thatcher inaugurated led to a 25-year firestorm of wealth creation in this country, seducing many of us into the consumer society it spawned. But what about the repressed – those thousands upon thousands cast upon the human scrap heap and lacking the psychological wherewithal to get off it? Did there have to be so many of them? And now we’ve got them and the country is buckling on the verge of a triple-dip recession, what do we – what can we do – for them? 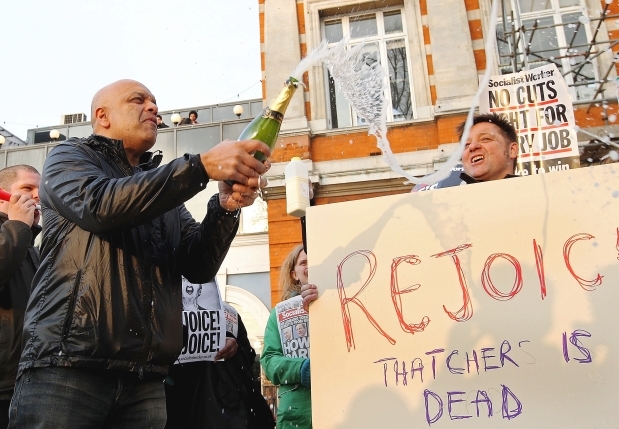 The repressed are as much Thatcher’s children as the seduced. Thanks for this article. My perspective on Thatcher has changed over the years. I really enjoyed it and found it thought-provoking (although I’d have a liked at least a passing nod to the fact that many of the economic changes to old industries that Thatcher implemented were determined by global factors). It might also have been interesting to consider how her response / leadership during the Falklands War was reassuring to those who felt their “British” identity of being part of a global power challenged in the modern world. What would a Spiral Wizard do then? Excellent analysis. I’ll add the unintended consequences of runaway Orange – bubbles, which must burst! The “seduced” are now joining the repressed in droves as unsustainable practices come crashing down around us. We could chart the Regan legacy in the US in exactly the same process. We can’t blame the conservatives here. Clinton was seduced also into dropping the last regulatory barriers and refusing to allow States with more observant regulators to curb the derivatives mess. The work of Ariely and Schulz reminds us that while Red is driven by ACE, Orange and Green are driven by more subtle irrationalities, particularly the Orange one that we can outrun the consequences of our own mistakes or the Green idea that big brother government can fix it all in spite of a century of evidence to the contrary. Excellent and balanced perspective, Keith.I do rmember how ‘Maggie closed the coal mines in Hemsworth” with all the bitterness. I am very interested in how a Spiral Wizard would done things if one could shift from ideology into functionalism. In this country how an Obama leadership could have done much more than simply attack the traditional, by sitting down and drinking so tea with several of the parties. It is critical to bring s much of the spiral with us as possible. We must learn how to do that..We are about to return to South Africa with a Back to the Future: South African re-events itself for the 21st Century. . .and beyond. Will be working with Stellenbosch University and others. Will keep you in the loop.